Having two very messy young boys and a construction worker husband has been really hard on the floors in my home. There are constantly crumbs scattered through the house (honestly, it doesn't matter WHAT they eat, the crumbs follow them into EVERY room) and dirt, dust and debris from my hubby's work boots littering my front hallway. 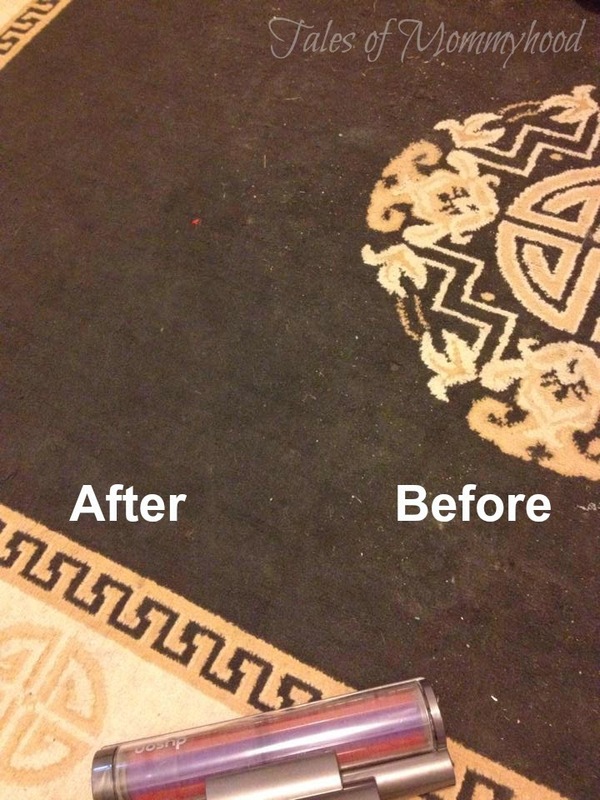 I have tried numerous vacuums over the years, and none of them left me feeling like my floors were truly CLEAN. I often got flustered while emptying out the bagless vacuums and cleaning the filters (then of course, having to wait until the filters were completely dry before using the vacuum again). This was the first time I have used a canister vacuum, all the other machines I have used have been uprights or central vac. I found the DC78 rolled easily along the floor as I was vacuuming, the suction was great and picked up all the dirt it rolled over. Changing tools is easy and quick to go from one type of surface to another. Emptying out the bin was super easy. One button click to release from the unit, and another button clicks open the bottom and the contents release into the garbage (I found it best to place the bin into a garbage bag and release). 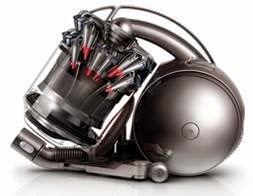 I have always heard amazing things about the Dyson brand and the technology they use. I was extremely pleased with the results the first time I used the DC78, and have been equally impressed every time since. 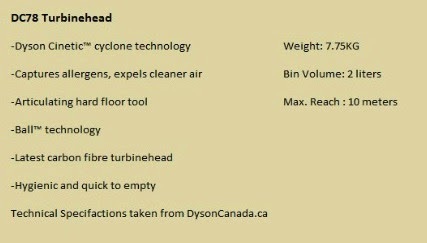 "DC78 Turbinehead has Dyson Cinetic™ cyclone technology. 54 ultra-efficient cyclones with oscillating tips extract microscopic particles. Because of their efficiency, there’s no filter that needs washing or replacing meaning there is no loss of suction. With our latest Ball™ technology it turns on the spot with no awkward moves. And Dyson’s most advanced cleaner head technology ensures high dirt pick-up across all floors. DC78 Turbinehead comes with an Articulating hard floor tool and Soft dusting brush." Feel free to connect with Dyson on Facebook and Twitter to stay up to date on their latest news, products and promotions. 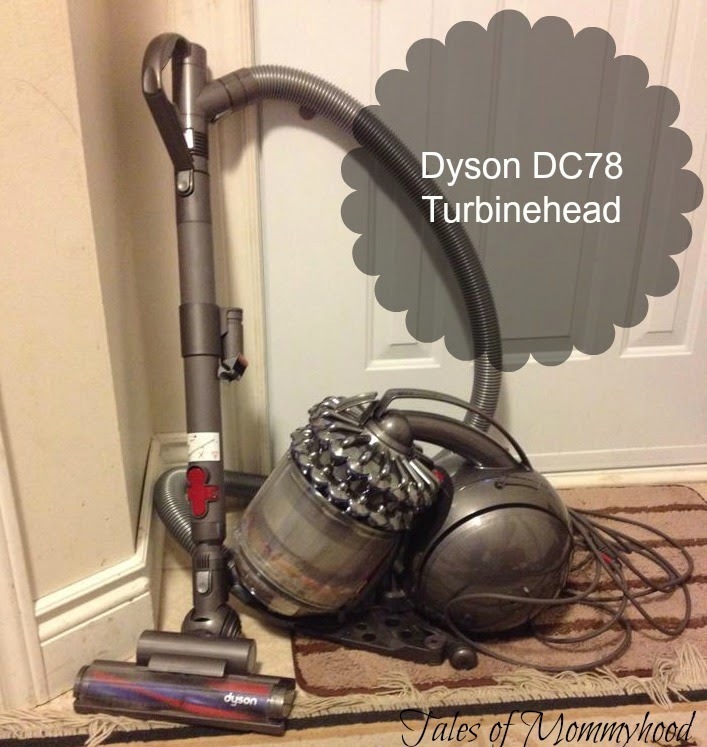 Thank you to Dyson Canada for sending the above mentioned product in exchange for this review. 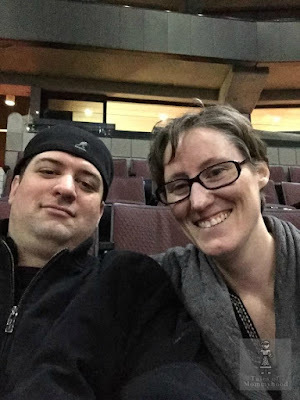 All opinions are honest and belong to Tales of Mommyhood; your opinion/experience may vary. Living with two small boys and one big one is messy business. I could probably vacuum every day. There are always crumbs everywhere. And the dog doesn't help either. 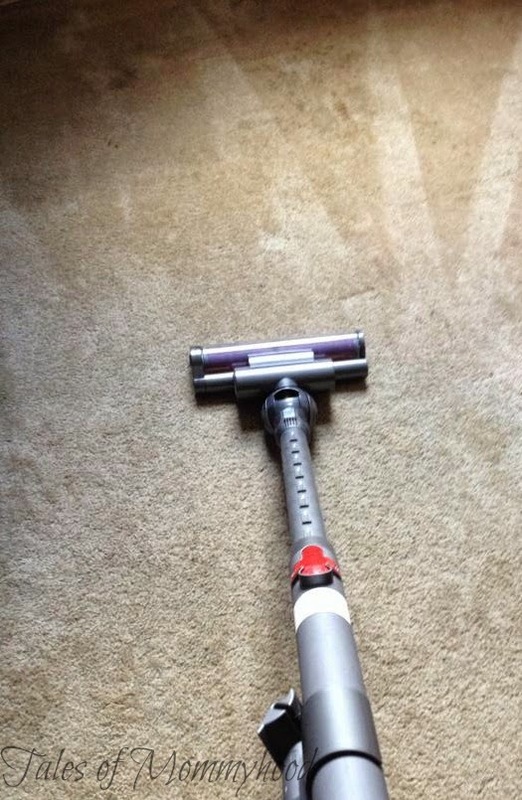 This vacuum looks amazing! :) it really is great! I love Dyson! We have a 5 year old Dyson in our house and it still works great. The DC78 sounds great. Maybe we'll have to consider this one when we trade up! I have a dyson and love it. Use to think they sound to expensive, but they are well worth it! I just received a Dyson too for review! I cannot say how IMPRESSED I am with Dyson! Everyone who comes over to my house, I make them vacuum with the Dyson for a minute so they can see how powerful it is! lol! Oh man.. a dyson would be handy in this house! That's an amazing looking vacuum cleaner! Sounds great! This will be my next purchase! !